Malaria is found most often in warm climates and while common in Africa, Asia, South America and the South Pacific, has been reported in Europe and North America as well. With climate change and global warming, there’s the danger that malaria could make a comeback. Ronald Ross, a British doctor working in India, is credited with the discovery of the transmission of malaria by the Anopheles mosquito, and was honored with a Nobel Prize for Medicine in 1902. 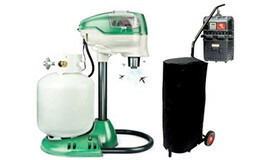 The World Health Organization has estimated that the world might see 26 million more new cases of malaria if insecticide resistance is not adequately dealt with. 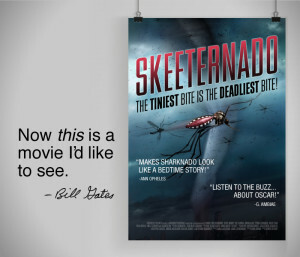 Bill Gates who refers to the malaria mosquito (Anopheles) as the deadliest animal in the world has provided funding and resources through the Bill & Melinda Gates Foundation, towards the global eradication of malaria. Malaria is preventable and treatable, and history shows that it can be eliminated. To date, the foundation has committed nearly $2 billion in grants to combat the disease and over $1.6 billion to the Global Fund to fight Aids, Tuberculosis and Malaria. Derived from an ancient Chinese herbal remedy, artemisinin has long been considered a wonder cure for malaria. The drug is produced from the sweet wormwood tree used in Chinese traditional medicine for centuries. It was reportedly given by China to Cambodia’s Khmer Rouge regime in the ’70s, when its use as a malaria treatment was rediscovered. Fast-acting, with few side effects, it was almost 100% effective. 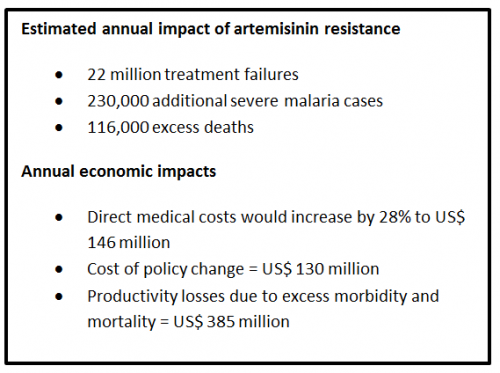 But increasingly, artemisinin is failing to work in some areas where malaria has developed resistance and there is a call to develop other potential treatments. Drug-resistant malaria first emerged on the Cambodia/Thailand border and has recently been detected as far west as the Myanmar/India border prompting scientists to call for a vigorous international effort to contain this enormous threat. Drug resistance is in part due to the widespread use of artemisinins; overuse of these drugs has been the largest contributing factor, although inadequate treatment practices and patient non-compliance have also contributed to the problem. 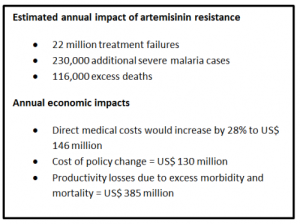 The economic impact of widespread artemisinin resistance is estimated to be US$0.5 billion each year, seriously undermining years of malaria investment and creating a new economic drain on endemic countries.